On January 31st, Yesh Din filed a petition with the High Court of Justice to reverse an expansion of “state land” boundaries in the Shiloh Valley that seized privately owned Palestinian land in order to retroactively legalize the notoriously (and recently) violent Adei Ad outpost. In 2014, Palestinian landowners, in cooperation with Yesh Din, first petitioned the Court to evacuate the unauthorized Adei Ad outpost which was built on their land in contravention of both international and Israeli law. Instead of enforcing the law, the Israeli Civil Administration announced that it would “reexamine” the boundaries of state land in the area, an examination which found that Adei Ad was, according to the new Israeli mapping of the area, built on state land. To make the findings of the reexamination official, the Civil Administration used an entirely new procedure (a “declaration amendment”) to expand the boundaries of a previous state land declaration. In so doing, the Civil Administration found a way to avoid issuing a new state land declaration, which can be challenged in a court by Palestinians and legal groups like Yesh Din. For “declaration amendments,” landowners can only seek recourse through the Civil Administration. Objections filed to the expansion of state land in this case were all dismissed. The new petition seeks to stop the implementation of the next step in the Civil Administration’s process to retroactively legalize Adei Ad, a plan that was announced in August 2018. Under the scheme, Adei Ad will be retroactively legalized by defining it as a “neighborhood” of the Amichai settlement – the first new government-backed settlement in 25 years, approved as payoff to the settlers who were evacuated from the unauthorized Amona outpost – located nearby. In 2013, Yesh Din published a lengthy report about the Adei Ad outpost – how it was established and how the settlers who live there use violence to take over more and more land from nearby Palestinians. Ir Amim reports that settlers are behind two new eviction proceedings against Palestinians in the Muslim Quarter of the Old City of Jerusalem. In the first case, the Abu Asab family received a notice that they must vacate their home in the Muslim Quarter by February 12th. The family has been renting the house since the 1960s, when the Old City was under the authority of the Jordanian government, which managed leases for vacant properties. In 2014, a settler-run trust – the Maisel Trust – petitioned to annul the family’s protected tenancy rights, arguing that those rights had been lost when the original tenants allegedly “abandoned” the property (the current residents are second generation relatives of the original renters). The Court ruled in the settlers’ favor in, and a subsequent appeal against the ruling was rejected. In the second case, just 100 meters away from the Abu Asab family home, the Ghaith-Sub Laban family was warned that another settler-managed trust – the Gengel Trust – filed a new request for their eviction, arguing that the original tenants had abandoned the home and therefore forfeited their protected tenancy rights. The new eviction proceedings were initiated despite a 2016 Supreme Court ruling that held that Nora Gaith and husband Mustafa Sub Laban are legally allowed to remain in the apartment for 10 years), at which time their protected tenancy will be (prematurely) terminated and their children’s status as protected tenants annulled. Ir Amim notes that there are a total of eight Palestinian families at imminent risk of eviction in the Muslim Quarter of the Old City, all in close proximity to the cases detailed above. On February 7th, the Planning & Budgeting subcommittee of Israel’s Higher Education Council voted 3-2 against the approval of a medical school in Ariel University, reversing the subcommittee’s previous vote to approve the medical school in July 2018. The Israeli Attorney General’s office ordered the second vote after it was revealed that one of the members of the subcommittee should not have been able to vote in July 2018, due to a major conflict of interest (Ariel University had promised the individual a promotion in the event the school was approved). Since receiving the approval in July 2018, Ariel University has taken significant steps towards opening the medical school this fall, despite multiple unfolding controversies surrounding the process by which the school was approved. In addition to addition to the controversy surrounding the July 2018 vote, Israeli Education Minister Naftali Bennett is accused of violating government rules to secure a legal opinion in favor bringing the school under Israeli domestic laws (an act of de facto annexation). Bennett is also accused of inappropriately intervening to expedite the approval of the school. As FMEP has previously reported, Ariel University became an accredited Israeli university in 2012, following significant controversy and opposition, including from Israeli academics. It has since been the focus of additional controversy, linked to what is a clear Israeli government-backed agenda of exploiting academia to normalize and annex settlements. In 2018, the settlement broke ground on the new medical school, with significant financial backing from U.S. casino magnate, settlement financier, and Trump backer Sheldon Adelson. In February 2018, in an act of deliberate de facto annexation, the Israeli Knesset passed a law that extends the jurisdiction of the Israeli Council on Higher Education over universities in the settlements (beyond Israel’s recognized sovereign borders), ensuring that the Ariel settlement medical school (and its graduates) would be entitled to all the same rights, privileges, and certifications as schools and students in sovereign Israel. As a reminder, Ariel is located in the heart of the northern West Bank, reaching literally to the midpoint between the Green Line and the Jordan border. The future of Ariel has long been one of the greatest challenges to any possible peace agreement, since any plan to attach Ariel to Israel will cut the northern West Bank into pieces. A group of Israeli human rights activists have petitioned the Israeli High Court to revoke the special status of the Umm Zuka nature reserve and firing zone in the West Bank, saying the Israel’s designation of the land as a protected area has only served as a pretext to remove Palestinians and allow settlers to take over. The petition goes on to explain that Israeli settlers have built an unauthorized outpost on the land that is slated to be added to the existing nature reserve, and have essentially turned the wilderness area into a private settler park where Palestinians are not allowed to enter. Despite complaints, the Israeli Civil Administration has not removed the unauthorized outpost – which consists of several structures connected to the water, sewage, and electricity of a nearby army base. The Civil Administration spokesperson told Haaretz that it is undertaken unspecified “enforcement proceedings” against the unauthorized outpost. +972 Magazine reports that the settlers behind the posters have also distributed leaflets to business owners inside of the settlements which list names of Palestinians alleged to work with (or have family members who work with) human rights groups – ostensibly encouraging Israeli business owners to fire them. Observers have noted the similarity between these flyers and signs posted by the Ku Klux Klan in the US years back targeting Black Americans. Among the most prominent signatories are Knesset Speaker Yuli Edelstein (Likud), Transportation Minister Yisrael Katz (Likud), Justice Minister Ayelet Shaked (New Right) Education Minister Naftali Bennett (New Right), Tourism Minister Yariv Levin, Environmental Protection and Jerusalem Affairs Minister Zeev Elkin, Public Security Minister Gilad Erdan, Culture Minister Miri Regev, Regional Cooperation Minister Tzachi Hanegbi, Communication Minister Ayoub Kara, Immigration and Absorption Minister Yoav Galant, Social Equality Minister Gila Gamliel. The settlement agenda promoted by former Prime Minister Yitzhak Shamir – the one mentioned in the Nahalah pledge – was one of unrestrained growth and absolute opposition to compromise with the Palestinians and/or Arab governments in the region. Notably, Shamir’s promotion of the settlement enterprise was strongly opposed by then-U.S. President George W. Bush, who threatened to cut U.S. aid to Israel if settlement construction did not stop. As a reminder, the explicit ambition of the Elad settler organization is to increase Jewish hegemony across all of Jerusalem at the explicit and intended expense of the Palestinian East Jerusalemites. In Silwan in particular, Elad has undertaken a multi-faceted campaign to evict Palestinians and increase the number of Jewish settlers living there. As a reminder, Kontorovich self-identifies as a key figure in the drafting of “anti-BDS” (but actually, anti-free speech/pro-settlement) laws in the United States. At the core of these laws is the conflation of Israeli settlements with Israeli proper, based on Kontorovich’s argument that Israel is not occupying Palestinian territory. Kontorovich has also testified multiple times to U.S. Congress, including in support of moving the U.S. Embassy to Jerusalem; in support of Congress legislating U.S. foreign policy, including with regard to Jerusalem; on the impact of the BDS movement, and in support of U.S. recognition of Israel’s sovereignty over the Golan Heights. A settler-run organization has released an analysis of Israeli government data citing the Trump Administration as a key driver of a “surge” in the growth rate of the Israeli settler population in 2018, and predicted a larger surge to come. The group claims the settler population in the West Bank grew by 3.3% last year (449,508 – excluding East Jerusalem – as of January 2019), compared to a 1.9% increase in Israel’s overall population. When another settler organization – the Council of Jewish Communities in Judea and Samaria – published near identical data points in January 2019 (literally last month), the overwhelming response of the settler community was to blame former U.S. President Barack Obama for a slowdown in the population growth from the 2017 rate, which was at 3.4%. However, if Gordon is correct in his prediction of a settler surge to come, that surge will indeed by blamed on or credited to – depending on the source – U.S. President Donald Trump. Peace Now has documented the sharp in increase in settlement advancements in 2018, which will eventually result in an increase in the population of settlers (by as many as 60,000 settlers) once those new units are built and sold. B’Tselem published an important new report entitled “Fake Justice: The Responsibility Israel’s High Court Justices Bear for the Demolition of Palestinian Homes and the Dispossession of Palestinians.” The report examines the role the highest court in Israel (and the only practicable avenue by which Palestinians can challenge Israeli policies and settler actions) has played in perpetuating the severe injustices inflicted upon Palestinians by the Israeli occupation and providing a guise of legality to for the Israeli policies behind them. Looking at its actions over the years as a whole, the report concludes that the court’s support of Israeli planning policy in the West Bank is tantamount to support for “forcible transfer” — a war crime. Jerusalem Affairs Minister Zeev Elkin celebrating the opening of a “visitors center” in a settlement near the central West Bank city of Nablus. On February 4th, the European Union issued its bi-annual report (pdf) documenting and analyzing trends in Israeli settlement activity from July through December 2018. 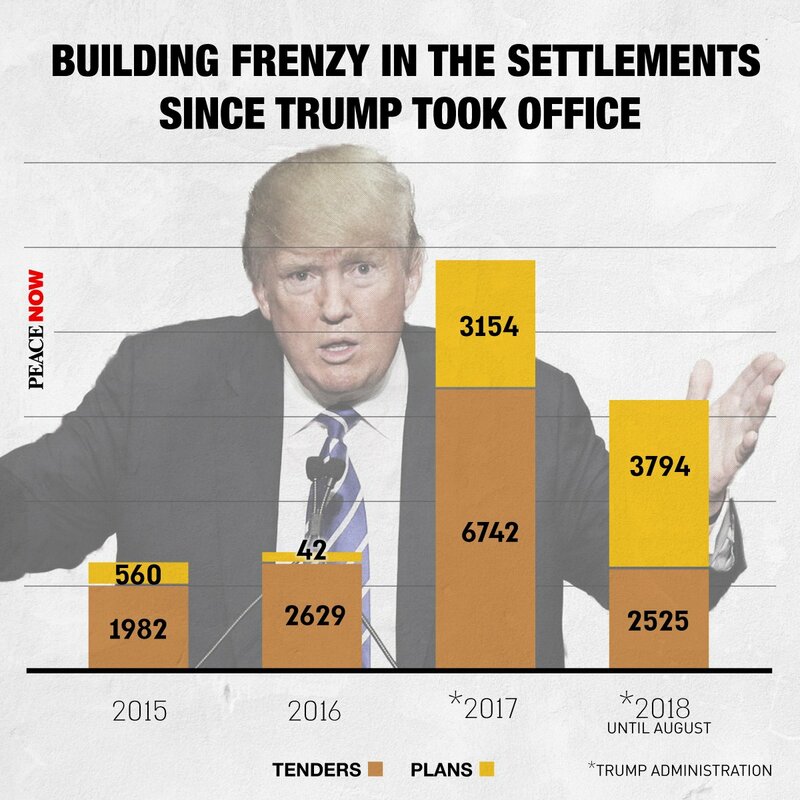 It also provides a big picture summary of settlement activity in recent years, which found that there was a three-to-four-fold increase in settlement advancements in 2017/2018 (the era of U.S. President Donald Trump) compared to 2015/2016 (under Barack Obama).